This is the state it was in today after many, many hours of work by the construction men with blue eyes and white hair who do not speak English. This morning I stopped one of the men to ask if we might be getting a new toilet. He looked at me blankly, so I pointed at the toilet, made a face to show my disdain for it and then jerked my thumb out the door. Then he took both his hands, and moved them from right to left. I figured that meant that a new toilet would be coming, and once it came, would be installed in place of the old toilet. Or he could have just been telling me that sometimes he, too, has arthritis that acts up and makes him jerk his hands around. 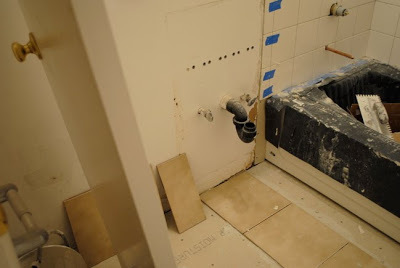 When I got home from work, it was confirmed that indeed we would be getting a new toilet and sink, at least as indicated by the absence of the old fixtures. 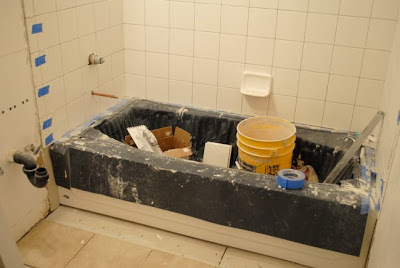 Our landlord called to apologize for the inconvenience of not having a toilet, sink or bath and to assure us that it would all be done–get this–tomorrow. 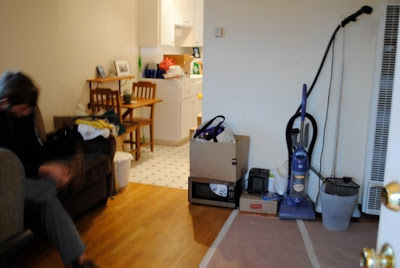 Then she asked how it was working out using the bathroom in the vacant unit downstairs, and because I didn’t want to tell her that it was creepy and exactly the kind of bathroom people are always caught in right before the killer shows up in horror movies, I said that it was fine. But I really miss having my own bathroom… inside my own place. Amidst all the moving was Alan’s birthday. It just wouldn’t be right in a story involving the both of us if there weren’t some tardiness involved, so I must admit that we took this picture 15 minutes before our dinner reservation. This probably explains why Alan looks like we should not be taking a picture at this time but getting in our car and driving to the restaurant, but that’s okay. 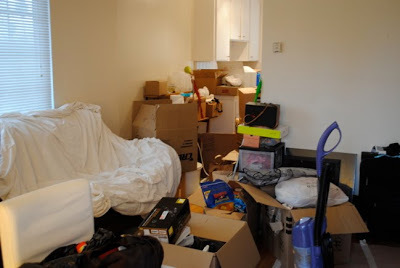 Moving in (especially with no bathroom) can be a pain, but in no time you'll feel at home and happy (and will have a newly refurbished bathroom!). Can't wait to see more photos of the new place! By the way, you looked super cute on Alan's birthday! I love the bright yellow, especially when it's so dreary here on my side of the pond. No bathroom? I'd be going crazy without a bathroom in my apartment! You are one patient person! Thanks Breenuh! I can only imagine what the weather must be like over on your side of the pond! If it makes you feel any better it's storming up cats and dogs here and for the next 9 days or so. I hope we have a functioning bathroom today too!! Happy Birthday Alan and hope you both have much happiness in the new place. Umm, I've been gone for too long, I didn't know you were moving! the place looks great and happy birthday to Alan too. Hope all is going well. Nice to catch up on your news a bit. Congrats on the new place!! And a happy birthday to Alan. 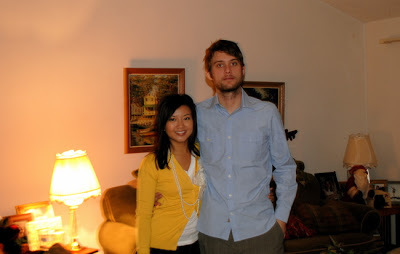 i love the yellow cardigan! i'm obsessed with all things yellow! where from? Comment- I am totally and fully 100% in LOVVVVE with the yellow sweater that you have on. Where did you find it at?